The Google Pixel 3 XL smartphone has leaked in what could be the clearest photos of the handset in the real-world yet. But that's not all that's been revealed by the insider source. 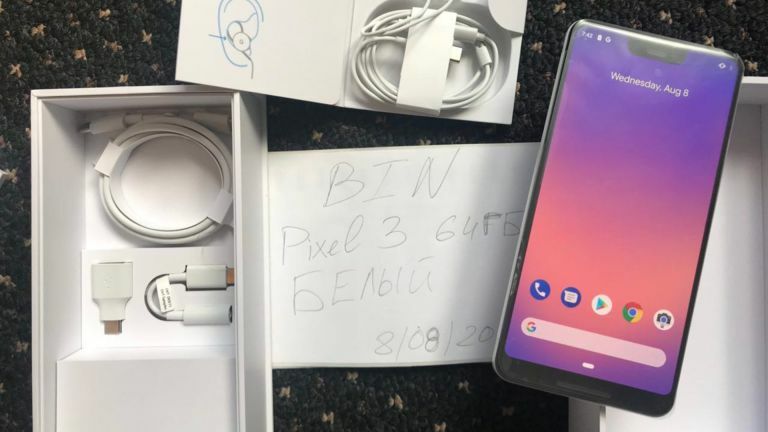 A set of revealing photos has appeared on the interwebs that appears to show off Google's new Pixel 3 XL, which isn't expected to be launched until October. IF you look close enough you'll see a reference to a dogfood notation by the camera icon, which is coder speak for testing in-house, suggesting these could well be a real, early stage unit, as leaked via Android Police. From the pictures we can see lots of previous rumours supported including that top-notch display, rear placed fingerprint sensor and single lens rear camera. There appears to be a bottom lip on the display, something that Apple's iPhone X does not have and its new iPhone X handsets should also avoid. Also revealed in the photos is a new set of earphones that connect via cable using the phone's USB-C port and an included USB-C to 3.5mm adapter. A great way to ditch the audio port without forcing people to buy wireless Bluetooth headphones. Presuming, of course, this lot comes free with the phone. All in all this isn't a massively ground-breaking handset when you look at the rumours for what is expected to come out from the competition soon. Perhaps there's more to come at that October reveal.